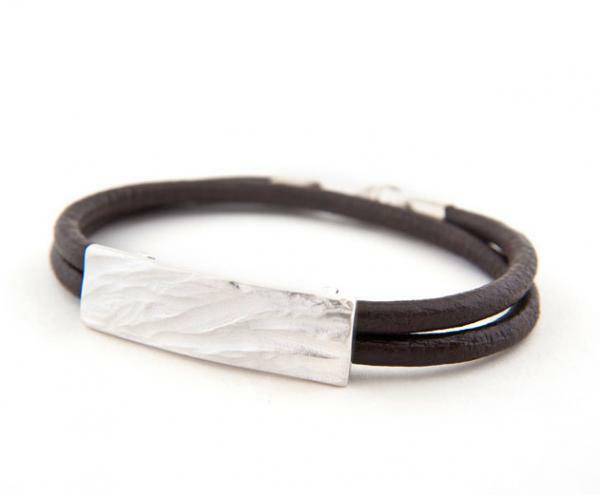 Contemporary leather bracelet, with British hall-marked solid silver detail. A textured slab of silver, shaped to fit the wrist, fixed to a chunky, dark leather double thong, this clever and tasteful take on the identity bracelet gives a tough, contemporary feel to any outfit. Hand made in our workshop in the Garden of England, this sculptural piece combines textured silver in a theme reminiscent of wind and soft sand with brown leather. We use a lobster shaped trigger-catch to fasten. The bracelet is presented in a stylish gift box, exclusive to Latham & Neve, making it an ideal gift for the perfect men or women in your life. Discreet enough for work but individual enough for the evening. Made to be worn!